At Ibiza Rocks Hotel. Carrying on the live music tradition on the White Isle. The Ibiza Rocks story started in the backroom of Manumission, moving to the Ibiza Rocks Bar - formerly called the Bar M - in San Antonio back in 2005. 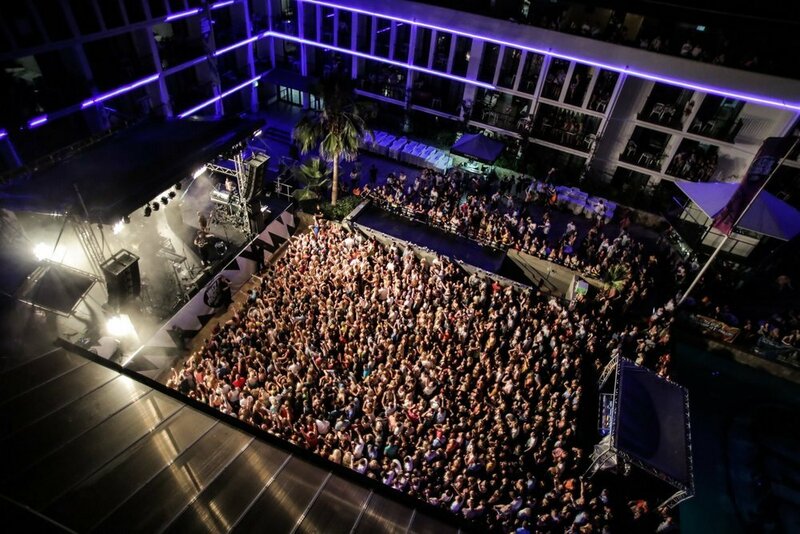 Hosting a variety of quality live acts over three years, the Ibiza Rocks Hotel was launched in 2008 and ten years later they continue to challenge the soundscape of the island. People often say that 'guitar music' is dead, but the team behind Ibiza Rocks have long battled to challenge this theory, and with so many years of experience behind them there isn't a soul on this island who doesn't believe them. Two seasons on from celebrating its milestone tenth anniversary, Ibiza Rocks' live series returned to lay down the stage for another slew of incredible live shows between 4 July until 5 September. In 2017 it took on the Tuesday slot. There is a hunger for live music on Ibiza. From the younger crowd who love Chase & Status, Jake Bugg and the like to the more seasoned music fans who were treated to some of the greatest nights of music over the last few years courtesy of New Order, CHIC! and Madness, all is proof that there is much more to this island than superstar DJs and monster clubs. Ibiza Rocks ensure all bases are covered - whether it's indie, folk, rock, urban or electronic, a Tuesday night spent in front of that famous stage, next to the pool and under the stars is guaranteed to make your holiday one to remember. Your line-up this past summer included South London rapper Stormzy who was in on Tuesday 11 July with the first ever #MERKY Festival. On 18 July it was the turn of NME Award winner Dua Lipa who made her Ibiza Rocks debut and the final gig of the month went to Grammy award-winning Clean Bandit and Atlantic Records pop-soul newcomer Mullally on July 25. First up in August was four-piece indie rock band Bastille. They came in strong after their Wild Wild world tour and huge festival appearance and your support for the session was from Warner Brothers signing Rationale. Finally, on 5 September Ibiza Rocks favourites The Kooks were in with their 'Best Off…So Far' gig for the climatic closing. The band, who have been part of the family since it all began in 2005, pushed hotly tipped Brighton band Fickle Friends as support. Remember guys, on the island this is your home for where the best in live music happens from 14:00 to 23:00 on Tuesdays.